Calling all Gas engineers! We are giving you a chance to win a set of brand new manuals worth over £150 starting TODAY. This includes the Domestic, Commercial Catering, Commercial Heating, LPG, and Gas Safety Awareness manual. 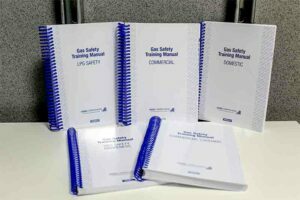 These manuals are perfect accompaniments to all Logic4training gas ACS courses and will also act as an invaluable reference tool when working onsite. They are a handy – A5 in size, which make it extremely easy to fit into a vehicle compartment or tool bag. The manuals are also designed to take punishment, so don’t worry if you spill your tea on them – They are made of strong stuff! 2) Check-In when you visit one of our centres. We will be holding a random draw on the 14th and the winner will be contacted via Facebook.